« Le premier trailer de Kawaii Killer est sorti ! Here it is, the first trailer of Kawaii Killer! Get your weapons and be ready to smash, slice, saw, strike and hang the cute animals of the Kawaii Forest! Available on Android and iOS smartphone/tablet this summer. Do not hesitate to share this marvelous news with your friends (only if you’re not a member of an animal rights movement, otherwise please excure us for our bad sense of humour regarding cute animals, or get angry and let us be involved in a TV talk show about violent video-games!). 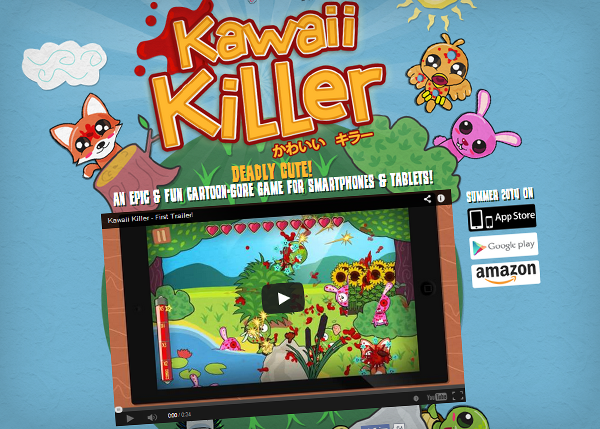 Here is the new website with the trailer: kawaii-killer.com !